ISSN 1550-3402 (Single User License) 28-page document. <<>> The reports from the “All in Japan" series (ISSN 1550-3402) provide overview and concise up-to-date description of each product from a specific product or therapeutic category approved in Japan. 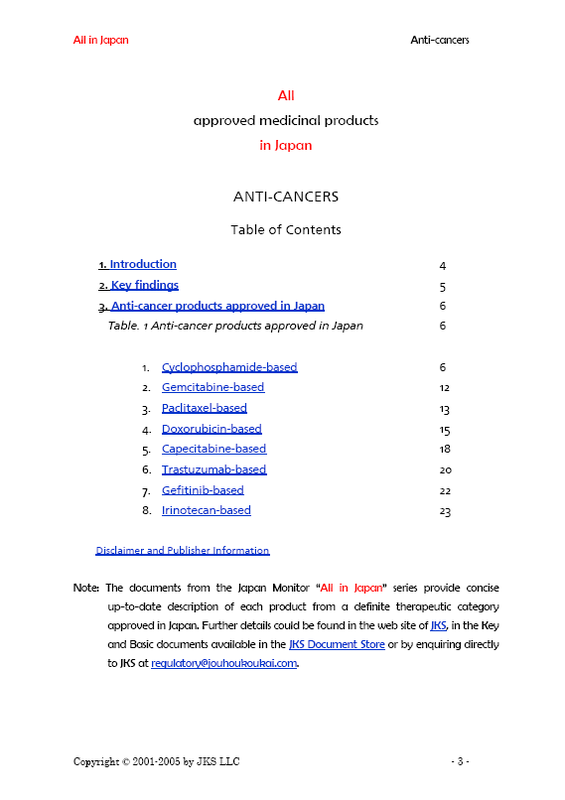 All in Japan: Anti-cancers report is the first of the sub-series of reports covering exclusively the prescription class therapeutics approved in the oncology field in Japan. <<>> Key Features: Presented in details are selected eight individual active substances: cyclophosphamide, gemcitabine, paclitaxel, doxorubicin, capecitabine, trastuzumab, gefitinib, irinotecan �Eall approved as medicinal products in Japan. Key package insert information and formulation specification for quick referencing - package inserts version (issued by the pharmaceutical manufacturers, importers or the entities commissioned to market the approved product), formulation, packages, indications, approved doses and schedules. All 25 marketed variants of the products are described by brand, maker/importer and marketer/distributor. <<>> Analysis Highlights: Recently introduced strategy for accelerated approval of product already registered in the major regulatory regions of EU and North America, but yet unapproved in Japan is expected to considerably diversify the cancer treatment options in Japan. The current and the subsequent reports on the anti-cancers in Japan shall provide for the first time in English exhaustive description of the both patented and generic products on the market. <<>> Practical Use to the Reader: Anti-cancer product managers wanting to enter the Japanese market. Regulatory affairs personnel seeking regulatory approval for their oncology product in Japan - an indispensable information source particularly for registration feasibility. Oncology marketing specialists �Ecan evaluate (or reevaluate) their Japan strategy by having access to regulatory information normally unavailable elsewhere. Researchers studying and/or comparing particular makers, markets and/or disease and conditions. Invaluable reference material to confirm or refute current concerns arising from a regulatory strategy to register oncology products in Japan. <<>> Copyright © JKS LLC 2005.